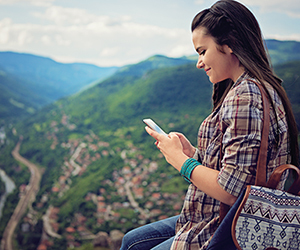 An international sim card can be one of the best ways to cut your roaming costs and international calling expenses when you travel or study abroad. Since you more than likely already have a mobile phone, save some money by taking it with you during your education abroad! If you meet these basic guidelines, you can keep your current mobile phone and simply change the sim card in the back. It will instantly give you a local number, lower cost calls and you will totally avoid all roaming charges that are traditional when you use your phone abroad. Mobile phone bills can add up quickly when you’re raking in the roaming charges, but phones have become an integral part of our daily life, and making sure you have the ability to use your phone as needed when you land in your host country is important. A SIM card when abroad is often the most cost effective and convenient way to stay connected. However, it’s key to find a provider with a flexible plan tailored to your needs as a student including unlimited talk, text and data if possible. As a SIM card user, you’ll be given a local number and enjoy local rates. Once you have your card you can simply swap out your old SIM (making sure to save it for when you return home), activate the new card with the provider, and you’ll be good to go. Success while studying abroad requires preparation. Part of that preparation is making arrangements for a SIM card service before you arrive. That way, you can use your phone immediately without service interruption or expensive roaming charges during a change in service. If you’re traveling to the USA, we offer SIMs through the only provider in the world dedicated to international students, studentSIMS. We also offer SIMs if you’ll be traveling to Australian	, Canada, and New Zealand. Please visit our international sim card	page for more information about sim cards for other countries around the world.